Whatever the motivations behind it, the current trend in mobile seems to be devices that are increasingly growing thinner every year. While that’s great for bragging rights, the problem is this sometimes comes at the cost of battery capacity. Sure we have more power efficient processor to tackle this, but at the end of the day they still need mAh to make them tick. Attacking the battery life issue from a different angle are advancements to how quickly our smartphones and tablets fully charge. We know Qualcomm has Quick Charge 3.0 on the way (capable of going 0-80% battery in only 30 minutes), but new tech from Huawei looks to beat even that. By a lot. 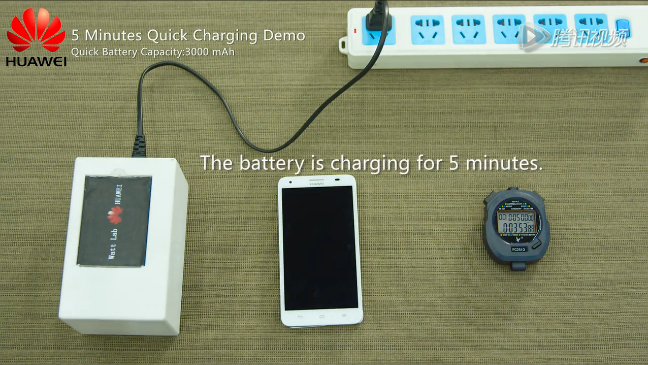 Announced on the Huawei Fans Club Blog, Huawei’s Watt Lab showed off a new kind of lithium-ion battery that can charge 10 times faster than those other guys. Using heteroatoms they bonded to the molecule of graphite in anode — which offer increased charging speeds without a decrease in energy density or battery life — Huawei was able to charge a 3,000mAh battery (620 Wh/L energy density) to 48% in only 5 minutes, which allowed for ten hours of call time. Don’t believe them? There’s of a video of it in action here. There was also a smaller 600mAh battery that could hit 68% in only 2 minutes, more suited for smaller devices like wearables. Huawei believes their breakthrough could lead to a “revolution” in electronics devices like smartphones, wearables, mobile power supplies, and even electric vehicles. It seems every few months we read about some new advancement in battery tech, only to find it’s not really well-suited for consumers devices. There’s no telling when Huawei’s new battery life will hit market (if ever), but it’s an exciting breakthrough none-the-less.